We called it Red Dirt Pond. I would like to tell you that I hunt with a sophisticated, creative group of hunters, but that would be a lie. The pond was named for simply what it is: a small water hole in the red clay of Colorado. Surrounding the pond was a stand of white bark aspen trees, and perched 20 feet up was a predator. I had never hunted Red Dirt Pond before, but the circle of elk tracks in the ring of dirt told me I had to. It was nearing the end of light, just about the time you decide nothing is coming in for the night, when they appeared. A small herd of elk coming through the aspen grove, and He was with them. A decent bull pushing his cows directly past my tree stand. Before I knew it was time, the moment had come. He stood 19 yards away, unaware of the whisper of an arrow moving across the rest. I let the arrow fly and instantly felt sickness in my gut when the arrow impacted the front shoulder of the bull. He immediately ran away, my arrow impotently dangling out of his side. I whispered a prayer the bull would live and not suffer from my poor shot. If only the expandable broadhead could have penetrated the shoulder, it would have been over. I looked for that bull for a long time, but I had lost him. It is a feeling of defeat, and a soul sickness only archers know and loath. The loss of an animal who had to suffer for its last few hours, never to be recovered. If you hunt with a bow long enough, you too know this feeling. Since that fated autumn day I have been seeking a strong, small, two blade broad. 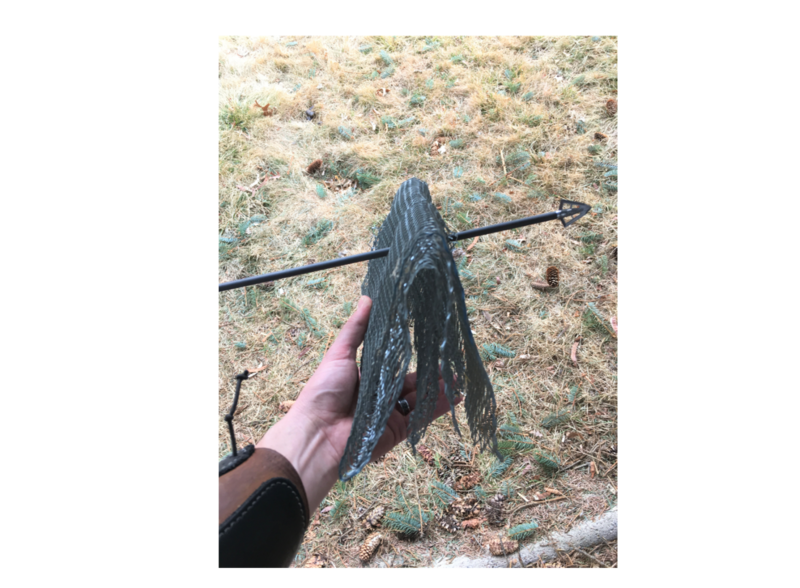 One that is tough as nails, accurate as field points, will pass through an elk on a clean double lung hit, and perhaps break bone on a shot too close to the pocket. In my quest for this perfect broadhead I tried many, each with its own strengths and drawbacks. I have to admit I have even glued an old Zwickey to a ferrule shaft adapter and given it a go, but the flight was less than optimal out of a compound bow. In our modern world of large diameter, mechanical, or three blades, this broadhead has been hard to find. Enter the Iron Will V100 and V125 Broadhead (IWBH). When I first learned about these heads I was intrigued by their slogan: "As Reliable as Science Allows." What I quickly learned was how much metallurgy and design has gone into building these heads. The IWBH is a short delta designed broadhead with small bleeder blades placed at the back of the ferrule. The main blade is one inch wide and the bleeder blades are .75 inches wide. This broadhead reminded me of the lines and heritage of tradition broadheads that relied on two blades and heavy, thick designs for maximum penetration on wooden shafted arrows. Your grandfather did not have the opportunity to shoot this broadhead, but I can tell you he would recognize it and want to use it. When I met with lead designer/owner William (Bill) Vanderheyden, what pleased me most was to learn that he is a hunter. 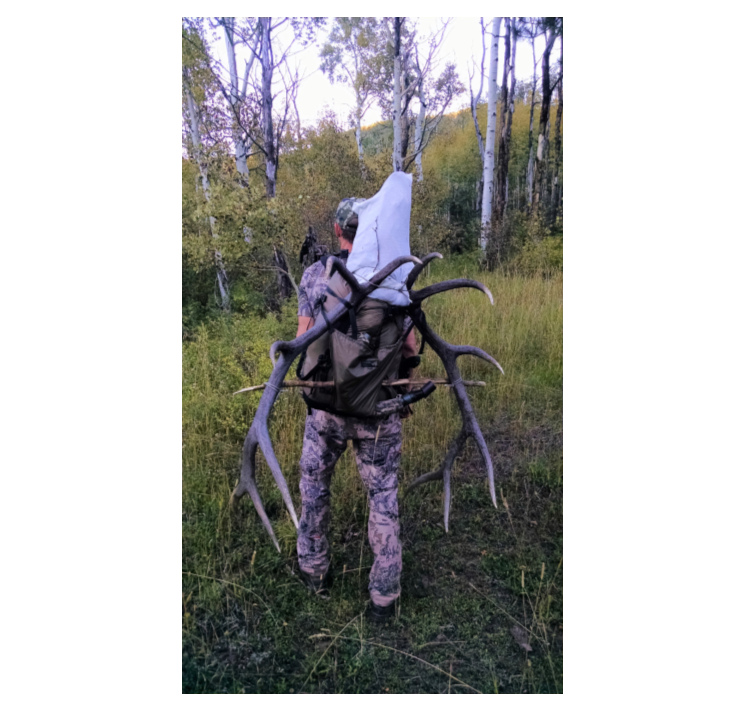 A true Colorado bow hunter who completely understands what the archer needs to make ethical kills. Bill is also a science and math wiz, and has spent the last 25 years working as a mechanical engineer. Out of this knowledge and hunting experience, the Iron Will was born. 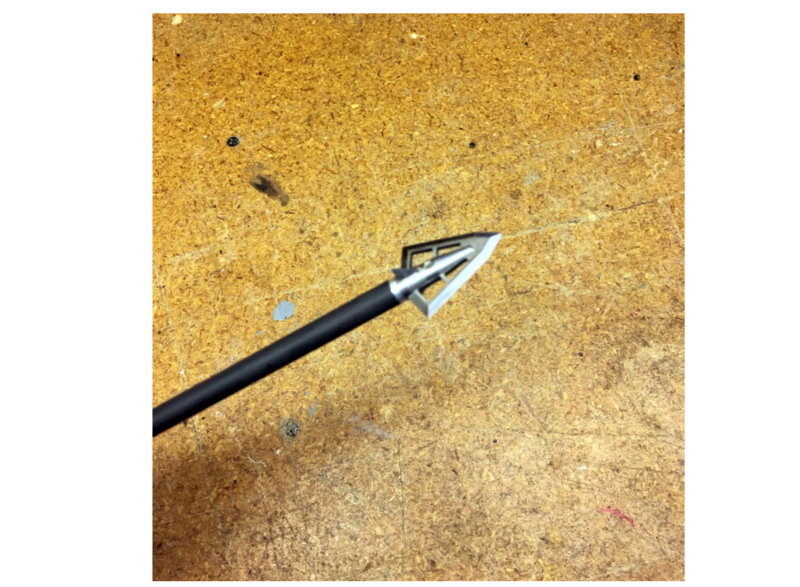 By hearing Bill talk about his broadheads, I could tell how passionate he is about his design. He speaks of the metal used to create the heads the same way a computer geek talks of processors and hard drives. He has a true love for his design and his pursuit of its perfection. The metal used in creation of the heads is certainly special. The ferrule on the V100 is made of grade 5 titanium . This is a super light, super strong metal, giving the broadhead a tough backbone to support the blade. The ferrule on the V125 is made out of hardened stainless steel, which is an exceptional metal and replaces the titanium on this model only to increase the weight of the head to the 125 mark. The blades on both models are made out of A2 Steel that has a cryogenic treatment and is triple tempered. This steel is the same steel that tools and high end knife makers use. Add all of this metallurgy and design together and you get one tough broadhead. To find out more about this broadhead, visit Iron Will's website. I have to admit the price of the IWBH is steep. At $99 for three, these are not your bargain basement broadheads. These are serious hunting tools, developed for the archer who craves meticulous, fine-tuned, deadly hunting implements. The upside of this price is the backing of a lifetime warranty. As long as you own the broadheads, if any of them break or are damaged for any reason, they'll be replaced free of charge. You can buy Iron Will's broadheads here. Custom engraved broadheads are also available for an additional fee. Bill supplied me with several IWBH, and I could not wait to try them out. My initial tests floored me. I have often had difficulty with fixed blade heads and have always had to tune them to the bow. My groups were amazing! 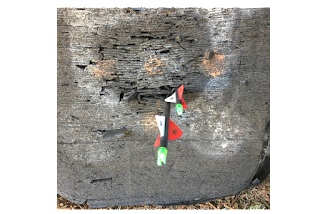 At 30 yards I was stacking the broadhead equipped arrows on top of field points. I was very impressed with the accuracy of the head. It flew like a field point. I then pushed the tests out to 40 yards. Once again the impact was nearly identical to the field point. I did notice about an inch drop of elevation at the 40 yard mark. My suspicion is this is related to the increase in air resistance as the head has cutting through the wind. You can hear a marked increase in flight noise of the head, but nothing more than what is common with fixed blade heads. What I can tell you is the IWBH is more accurate than I am! Once I had completed my accuracy testing I decided it was time to see just what the heads could penetrate and withstand. 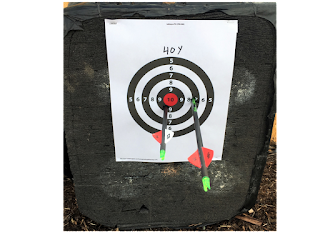 The bow set-up I used for this was a Matthews Outback, shooting a 29.5 inch, Gold Tip Hunter XT with blazer vanes (check out the arrow here). The bow was set at draw weight of 65 pounds, an arrow speed of 267 FPS, weight of 419.5 grains, with an average kinetic energy of 66 ft-lbs. See photo for full details of speed/ft-lbs test with this arrow, broadhead, and bow set up. For the first test I set up a panel box made out of 1/2 OSB ply board. 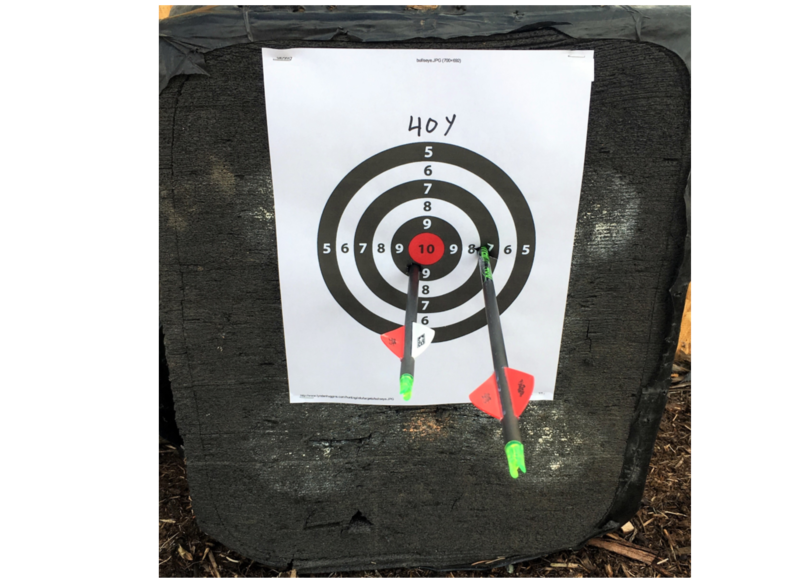 From 20 yards the arrow was able to penetrate both sides of the board. I shot several other broadheads into this set up and found mechanical broadheads and three bladed fixed heads could not penetrate the second board. Additionally, the IWBH showed no damage and the blades were still sharp after 5 shots. 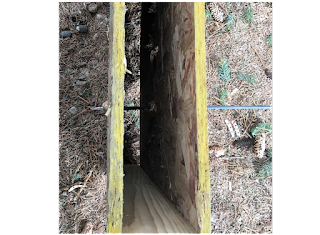 The mechanical broadheads were destroyed and unusable after one impact with the OSB. The next test was shooting through metal flat wire grating. I folded the grating over itself so there were a total of eight layers of metal grating. The IWBH sailed through all eight layers and through most of the foam block behind it. The mechanical could barely penetrate the metal grating and were again destroyed. I shot the IWBH through the metal 5 times and examined it afterwards. The head showed signs of dulling but was otherwise completely intact and functional. I could have sharpened this head and gone hunting with it. The last and ultimate test will be to go hunting with the IWBH. Unfortunately, given the timing of this article I will have to wait for a few months. Check back in the future for part two of this review after a (hopefully) successful hunt. The Last Broadhead You Will Ever Buy." Did you end up hunting with the IWBH? Did you ever get out with the Iron Wills? I am going to give them a try along with the Grizzly Stiks.